Posted on July 24, 2017 at 9:40 am. Humidity is sometimes abstract that most homeowners don’t have a good understanding of it during the HVAC purchase. But as an integral component of your indoor comfort, it makes sense to understand what humidity is and how it affects your indoor temperature. Humidity, which is measured by relative humidity, refers to the ratio of moisture in the air to the highest possible saturation level of air at a certain temperature. The warmer the temperature gets, the more vapor it holds. Air conditioner systems remove heat and moisture from the air in order to cool your indoor space. When the humidity level is excessive, your unit has to operate a lot harder. Unluckily, if your unit lacks cooling capacity, it won’t be able to catch up with extreme humidity. This adversely affects your indoor comfort. Using a humidifier allows you to make your indoor atmosphere feel cooler. You can opt to buy a small-size humidifier for a single room, or a large one for your entire house. Proper ventilation also helps in decreasing ventilation. Turn the vent fans on while opening a window or taking a shower. You may also turn the fan on when cooking. Using portable or standing fans in the bathroom, attic, kitchen, and other humid areas of your home increases circulation and decreases condensation and humidity. Increasing the temperature on your AC also helps reduce humidity. An alternative to blasting your unit is to increase the temperature while the fan is turned on. The humidity increases when the temperature increases. If you’ve tried different preventatives to humidity, but nothing still happens, it is likely that there’s something wrong with your unit. 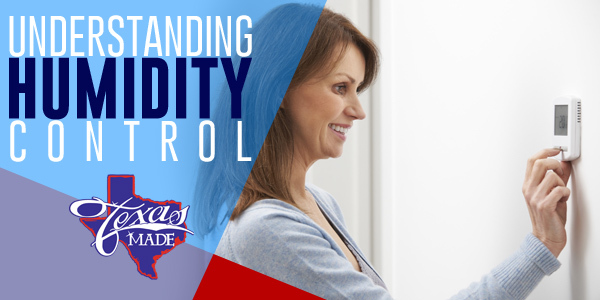 Call Texas Made Air Conditioning & Heating if your units are not working at their highest capability.